In April this year, the Reserve Bank of India (RBI) gave a three-month window to banks and other RBI-regulated entities to wind up existing relationships with firms or individuals dealing in cryptocurrencies. The restrictions came into effect on 7 July, in a big setback to the crypto market in India. About a month ago, the crypto market experienced another blow, when one of the country’s oldest crypto exchange, Zebpay, announced on 27 September that it was shutting shop. Other exchanges and investors are now waiting for the Supreme Court to hear a petition, filed by some of the exchanges and the Internet and Mobile Association of India (IAMAI), which challenged the RBI’s 6 April circular prohibiting rupee-crypto trade. Though the final hearing was scheduled to be held in September, it got postponed. Overall, the crypto industry seems to be in a shambles with trading volumes dipping at most exchanges despite the rise of peer-to-peer or P2P transactions and innovations by a few exchanges in a survival bid. As expected, there have been slumps in trading activity around the time of RBI’s announcement and when the ban came into affect. Older exchanges with a longer history and data of transactions have a stark story to tell. Sathvik Vishwanath, co-founder and CEO of Unocoin, the crypto exchange that started in 2013, said the present volumes are less than 10% of the volumes three months ago. Another exchange Koinex too has witnessed significant decline in trading volume. “At the peak in December 2017, we did around $265 million in trading volume in a 24-hour period. Right now it is about $1-2 million in a day," said Rahul Raj, co-founder and CEO, Koinex. 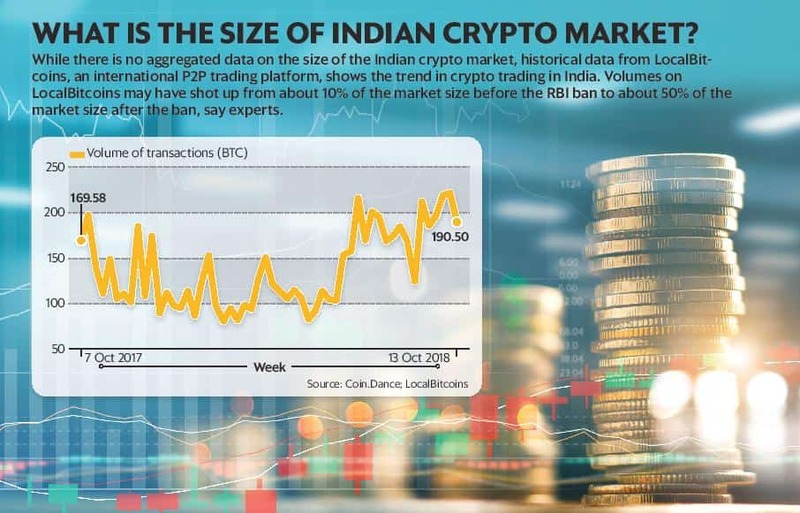 Though there is no aggregated data for the exchanges and trading in India, indicative data from LocalBitcoins, an international peer-to-peer or P2P trading platform, suggests significant decline in transaction volume. At LocalBitcoins alone, the crypto transaction volume in India in the week ending 16 December 2017 was ₹ 22.6 crore compared to ₹ 9.3 crore in the week ended 13 October 2018. Bitcoin prices hit the peak in December 2017. Vishwanath said it is important to note that LocalBitcoins was used by less number of people before the RBI ban became effective. “Earlier when there were no RBI restrictions, about 10% of the trading volume used to happen through LocalBitcoins. Now with the restrictions in place, we can easily say that it would have reached about 50% of the total volumes," he said. However, volumes are going up on exchanges that have introduced P2P transactions. “From August, we are seeing an uptick in the number of people signing up on the platform and transacting. We saw about 9,000 sign-ups last month alone, and most of these people are the ones who have never transacted in crypto before. Usually about 40-50% of the new sign-ups complete a trade after signing up," said Nischal Shetty, founder and CEO of WazirX, an exchange that started operations in March this year, and introduced P2P transactions in July. WazirX claims to have monthly trading volumes of ₹ 35 crore as on September. Moreover, customers from Zebpay, which was among the leading exchanges, are also migrating to P2P exchanges, hence their volumes are going up. At the aggregate level for India, though, volumes appear to have come down significantly, due to RBI restrictions. While the volumes have clearly taken a massive hit, some exchanges are trying to keep the boat sailing. Two exchanges, WazirX and Koinex, have come up with P2P trading. Now another exchange, Unocoin, has come up with another possible entry and exit solution for its customers. The exchange will be deploying kiosks like automated teller machines (ATMs) that will accept cash that will be reflected in the user’s rupee wallet on the exchange and can be used for purchase of cryptocurrency. Similarly, a user having a rupee balance in the crypto wallet can withdraw cash from the kiosk. According to Vishwanath, the first such kiosk will be set up in Bengaluru, and they will look at expansion depending on the response. The exchange will only allow KYC-verified customers to use the kiosk facility. “No cards will be issued. A KYC-verified customer will be able to use his user ID and OTP to authenticate himself at the kiosk," Vishwanath said. But why didn’t Unocoin go for a P2P model, like others? Vishwanath said the RBI notification clearly says that not only entities but even individuals are restricted from using their bank accounts for buying and selling of crypto assets. In a regular crypto exchange, the buyer transfers the money to the exchange, the exchange matches the transaction in the backend, and then transfers the asset to the buyer and the money to the seller. In the process, it charges a fee from the buyer and the seller. In case of a P2P platform, the exchange of money and asset takes place directly between a buyer and a seller. The exchange just brings them together on a common platform and facilitates exchange of information on the asset and bank account details. “What is happening in P2P is that banks, who do not know why the transactions are happening, are facilitating the trading. That according to us is a violation of the RBI notification and hence we did not introduce this mode," he said. Those offering the P2P facility disagree. “I would not call it a violation. The RBI directive is aimed at entities that are regulated by RBI and we are not. Though we are looking for a regulator, at present we do not have one. The directive does not stop us from innovating so we innovated a P2P model," Raj from Koinex said. Koinex has now added a collateralised trading option in its P2P platform. While Indian P2P crypto exchanges are only allowing KYC-verified customers to trade, there is an element of risk involved. A buyer can claim to have transferred the money to the seller without doing so or the seller could claim that he has not received the money despite receiving it (read more about it here). However, the buyer as well as a seller in a P2P transaction can increase his trustworthiness in the ecosystem by putting in a collateral in the transaction. Koinex has introduced collateralised trading which is completely optional for its customers. If there is concern about the legality of an asset in a market, the seller is at a disadvantage and might have to sell his holdings at a discount. For instance, there was some amount of panic selling at the time of RBI’s announcement and later when the ban came into effect. But the selling price is not depressed in India because the underlying asset is a global asset and the prevailing global price is determinant in the local price as well, Raj said. “Suppose the prevalent global price of a BTC is $6000 and someone is desperate to sell, the person can sell at $5900. But usually, there is a premium on BTC prices in India. If the price globally is $6000, it is possible it could be sold at $6100 in India," he said. The premium on Bitcoin pricing is due to the fact that large-scale Bitcoin mining does not happen in India. Indian users buy Bitcoin mined elsewhere by paying in foreign currency. The price is higher in India owing to forex transaction charges, mark-up as well as premium for low supply. With the future of cryptocurrency not certain in India yet, new investors should stay away. Existing investors need to calculate their risks.